And out of doors, with the hawthorn in blossom all along the river banks, everything is so beautiful that to go elsewhere is to leave beauty behind. So wrote the poet William Butler Yeats from his home in Thoor Ballylee, which is just as peaceful and lovely a place to-day as it was then. The Thoor itself is a small fortified tower house which was originally built by the De Burca or Burke family, Norman settlers, during the 1500’s and is not in itself either particularly old or remarkable. But it has a wonderful athmosphere – you can really feel the presence of the poet Yeats and understand why he loved it so much and was so happy there. When Yeats purchased the tower in 1917 for the sum of £35 it was in a state of considerable dilapidation and he spent the next two years restoring it as a family home. One of the first things he did was rename it. The building had previously been known as Ballylee Castle, and it was Yeats who renamed it Túr Ballylee, later anglicised to Thoor Ballylee. However he, his family and the many friends who stayed with them there simply referred to it as ‘the Tower’. The tower comprises just four rooms – one on each floor – connected by a spiral staircase. There were in Yeat’s time two small adjoining cottages provided extra accommodation, though only one of these remains now. I dream of making a house that may encourage people to avoid ugly manufactured things – an ideal poor man’s house. Except a very few things imported as models we should get all made in Galway or Limerick. He didn’t ‘fancy it up’ or alter its structure in any way, each room was plainly decorated and kept the bare or whitewashed stone wall internally and he furnished it in a minial fashion with traditionally style furnishings made by local craftsmen. Yeats never lived in Ballylee full time, it was a summer home chosen because it was close to Coole Park, home of his life-long friend Lady Augusta Gregory. And ‘ruin once again’ it became following his death. By the time Mary Hanley and the Kiltartan Society began to plan and raise funds for its purchase and restoration in the 1960’s it was once again in a very poor state. 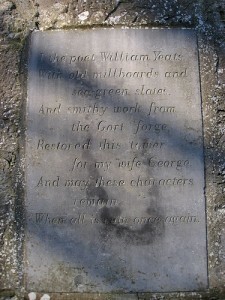 With great dedication and constant reference to the extensive notes Yeats made about his own restoration project, they managed complete the restoration in time for the centenary of the poet’s birth in 1965, when it was officially opened by his son, Michael. The tower is open to visitors from Easter to late September and is located off the Galway-Ennis road close to Gort. There is a small cafe in the adjoining cottage. Outside these times visits can be arranged by appointment – call 353 91 537700. 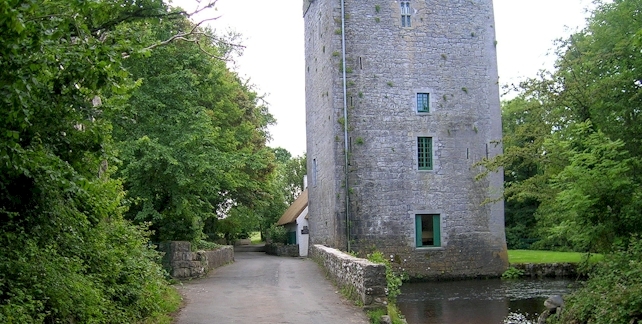 However the River Coole which runs beside the tower is prone to flooding and overflowing onto the road, so it may not always be possible to visit the tower in winter. Will the Tower be open again in July? Visited in April 2012. Closed up, flooded. No other info. Drove out there for nothing.